A hat that has been constructed will have a strong and stiff front. These plastic inserts or other form of material is called the buckram. Some caps are stiffened in the center front to accommodate the embroidered logo and this may be accomplished by sewing various kinds of stiffeners in the two front panels. Some hats will use foam to create a soft stiff front. Some hats may not have a constructed front which is called unstructured. These hats have more of a soft front and the hat will have a collapsible feel. The inside ring of the hat is called a sweatband. This may be cotton or even thin leather depending on what is requested. 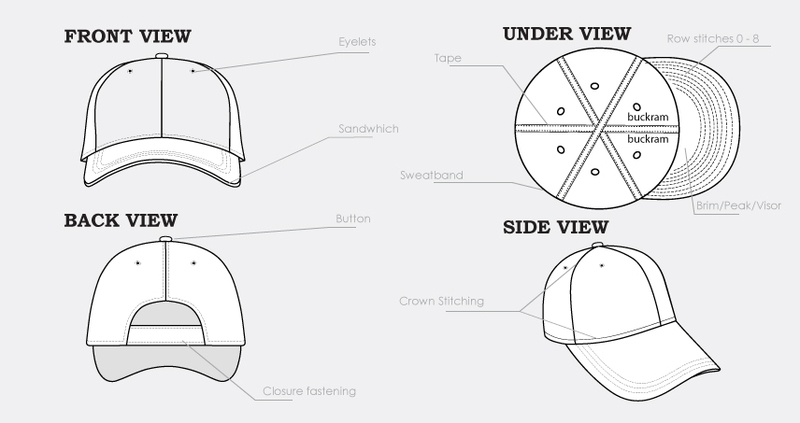 The hat is held together by stitching which can come in any color or match the panels. Stitching can also be clear to not obstruct the design of the hat. This is a popular option for sublimated hats that want show off the design without being compromised. Our hats all have eyelets to help hold the panel together. They be colored to create a more unique design. These eyelets also serve as breathable areas so the perspiration and heat that builds up under the cap can be released.